We’re pleased to offer precision Laser Engraving of exceptional quality and speed. We can accommodate small orders as well as production runs in a variety of materials. Call Don today for pricing and to schedule your order. Our Precision Die Cutting offers a variety of materials to your dies. Perfect for magnets, ornaments, gift items. Call Don today with your order. Large orders – no problem! Don’s Country Woodshop is ready for your CNC Routing projects. Your orders are in capable hands. Short Run; High Volume Production: From single part to high volume production, we manufacture it all. Set your plans in motion today: DC Woodshop will help you complete your plans in the most cost-effective manner. Don’s Country Woodshop has a complete range of signs, signage materials and engraving options. Call Don today to discuss your needs. 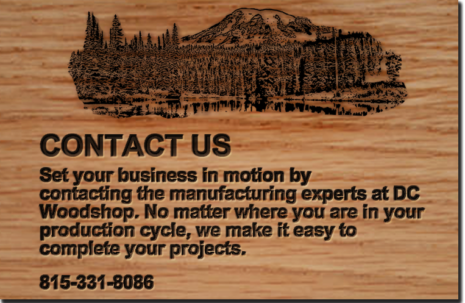 Don’s Country Woodshop has been in the Point of Sale Display Industry for years. We’re happy to make your POS display units in materials and specifications of your choosing. We produce both static and rotating displays, in all sizes, customized to your specifications. Send us your drawing or ideas – we’re happy to see what you’ve planned for the future. Have something special in mind? DC Woodshop offers expert craftsmanship in creating custom cabinets and furniture to your design specs. We work in a variety of woods and take the time in crafting functional, practical and affordable solutions to your needs.